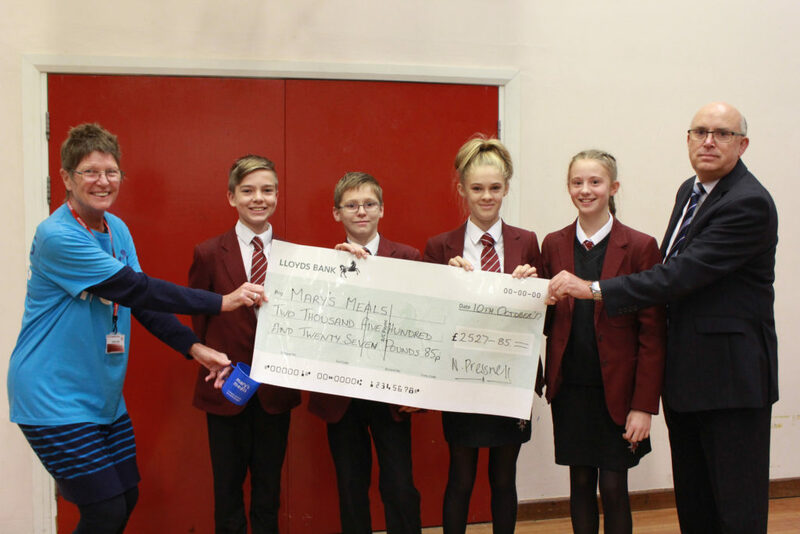 Y8 students present Anne White, a representative of Mary’s Meals with a cheque for £2500. The School, once again, shows what supporting others is all about with chosen charity Mary’s Meals. For the school year 2016/17 Mary’s Meals was chosen as the whole school charity. Mary’s Meals is a UK based charity, which aims to feed children in developing countries who do not have access to food. These life-changing meals attract hungry children into the classroom. The food fills their empty bellies so they have the energy and opportunity to learn, giving them the chance of a brighter future. The meals also support families struggling to feed their children while boosting the country’s wider economy. Research has proven that school feeding has a range of positive impacts, since children who are not suffering from hunger are able to make the most of their education. Around 61 million of the world’s hungriest children do not attend school. In order to survive, they have to work or beg. Even if they do make it into the classroom, hunger affects their ability to learn. At The Arnewood School we believe that all children should have access to food and education. Therefore, the school set out to raise funds to support the work of Mary’s Meals. Every tutor group had a collecting box and arranged fundraising events. These included cake sales, sporting events, raffles and a non-uniform day. The school raised over £2500 and as Mary’s Meals can feed a child for a whole year for as little as £12.20 the school is proud to say that their efforts will provide food for over 2100 children for a year. A cheque was handed over to Anne White, a representative of Mary’s Meals during a Year 8 assembly. Speaking to the students Anne congratulated them on their wonderful support and how it would make a real difference to so many children. Congratulations to everyone who supported last year’s school charity, Mary’s Meals.